An experimental "hyperspectral" spy sat which is able to detect buried roadside bombs and concealed cave or tunnel entrances has been handed over to the US forces for operational use in the Wars on Stuff. Hyperspectral cube gobbler from outer space. The TacSat-3 was launched aboard a Minotaur-1 rocket along with several other small satellites from Wallops Island, Virginia, in May 2009. The TacSat was designed to prove the US concept of "operationally responsive space", where a military user can make a request and a small inexpensive satellite can be in a suitable orbit within days rather than months or years. Thus the TacSat is designed to be fitted with a variety of different payloads as required by an operational commander. TacSat-3, as a prototype, carried one in particular known as the Advanced Responsive Tactically Effective Military Imaging Spectrometer, or ARTEMIS. This is a "hyperspectral" sensor able to detect not just visible light but infrared and ultraviolet as well. 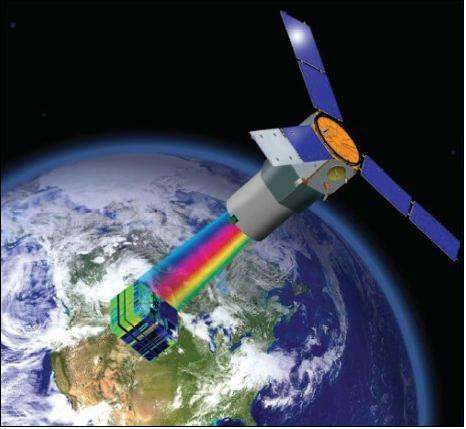 The idea of hyperspectral sensing is not, however, merely to "see" in the usual sense of optical telescopes, infrared nightscopes and/or thermal imagers. This kind of detection is used on spy satellites and other surveillance systems, but it suffers from the so-called "drinking straw effect" - that is, you can only view a small area in enough detail to pick out information of interest. It's impossible to cover an entire nation or region in any length of time by such means; you have to know where to look in advance. Hyperspectral imaging works differently. It's based on the same principle as the spectrometry used in astronomy and other scientific fields - that some classes of objects and substances will emit a unique set of wavelengths when stimulated by energy. In this case, everything on the surface below the satellite is being stimulated by sunlight to emit its unique spectral fingerprint.